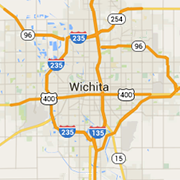 Experience the best of the Wichita area in these surrounding communities. You'll find shopping, lodging, attractions right at the city's doorstep. Located just 20 minutes north of Wichita, Newton offers an ideal family environment, affordable, quiet neighborhoods, outstanding schools and abundant community activities.